National Directory Information Services, LLC offers 2 primary services for the call center industry. Real-time caller identification data and self-service batch processing. Are your inbound agents still faced with blank forms for new callers? In the contact center, you can populate your agents screen with name and address fields using either a manually entered 10-digit telephone number or a callers ANI (Automatic Number Identification). CTI integration and agent desktop screen pop from existing customer data is now an industry standard. Calls from new, unknown callers can now be treated the same way and call centers can realize the same improvements in caller satisfaction and efficiencies. Stop wasting time and annoying callers with name and address spelling requests!. Imagine the difference in the dialog when a trained agent has a full screen with all of the caller's data. Now agents only have to verify information, not transcribe it decreasing entry errors, increasing agent productivity, and lowering costs. - Lower your operational costs — eliminate costly transcription fees and errors. - Decrease your marketing expenses — reduce returned mail caused by inaccurate data. - Enhance your customer experience — shorten call lengths through eliminating redundant name and address questions and allocating time for building relationships instead of data entry. - Increase your sales rate — spend more time selling rather than collecting contact information. Spelling requests, dialect and other barriers to understanding are reduced or eliminated. Instead, an agent with this capability leaves the caller the impression that your agents are more intelligent and better listeners than others they experience. 411XML data services merges daily updated telco directory assistance data - exactly what is provided to 411 call centers - with other sources to provide the most comprehensive coverage and most complete addressing in the industry. 411XML service works with captured ANI or caller-offered home phone. In cases where published 411 directory assistance data is returned, your agents can take a HUGE short cut and simply ask to use the name and address provided by our service. Without offending the caller's privacy. In other cases, call center agents will get through name and address questions with immediate speed and accuracy improvements. Are your new caller agents currently submitting USPS standardized zip+4 data? Reduce or eliminate fulfillment data problems right at the source! Our new condensed, simplified 411XML response scheme is simple to integrate in a variety of ways; server-to-server or client-to-server. * Depending on your training and operational procedures, the agent can remove or modify the data according to the caller's wishes before submission of the new contact form or trouble ticket, guarding the caller's preferences and privacy. Call or email for a free demonstration, but don't show this to your call center agents unless you are ready to subscribe. Once agents know this is possible, they must have it! Find fresh phone numbers for lists of disconnects and wrong numbers - instantly. 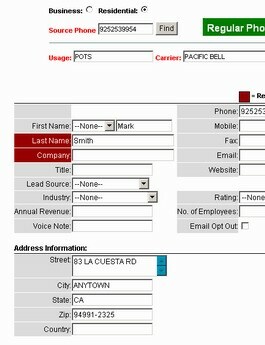 Use our self-serve batch processor to append fresh phone numbers on any list of names and addresses. NO minimums per batch, and NO waiting for turn-around, your staff can load lists of 10 or 10,000 with equal efficiency. Enjoy time-saving on your process schedule, not ours. Upload anytime; batches begin running instantly and you can monitor progress. Download result files and you are back on the phones. Whether using our real-time query engine to populate call center agent screens or our batch processing service, 411XML coverage and quality is unmatched. Our extensive and exclusive data sources ensure we provide you with a level of accuracy that was previously unattainable. Our data is never static or outdated. That's why our match rates are on average 25 percent better than the competition.